Today is National Something on a Stick Day! Now, Peeps can get boring. I was inspired by the recent cake pops trend and decided to make Peeps Pops. 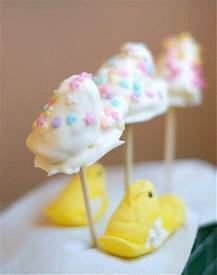 Regular Peeps dipped in white and dark chocolates to eat like lollipops. They were a cinch to make and far more fun to eat then just the regular marshmallow popping scenario. You can even tie baggies over the tops of some of them and give them to the kid's friends at school for a special spring treat. What a fun way to kick off the Easter season!